There is a dichotomy in Bluegrass music. We cherish and praise the traditional while recreating our favorite songs and sounds from the past. As builders, we retrace the details of the iconic instruments of the twenties and thirties over and over again. Sometimes it is difficult to reconcile our twenty first century reenactments with a simple truth: Bluegrass music was created by innovative singers, songwriters and instrumentalists. The music has continued to evolve as new generations of creative musicians have added their touch. It is a music of innovation AND tradition. As I have gotten to know and love the music of the Steep Canyon Rangers, I have always appreciated their ability to walk on both sides of this fence. Their vocals, stage presentation, and instrumental abilities recall the best of the Bluegrass tradition. But their multifaceted songwriting has convinced me that there is still plenty of room for innovation within the tradition. Album after album of predominantly original material has lingered on the Bluegrass charts, and song after song has worked its way into my perception of what is the Bluegrass tradition. With their most recent album and tour in support of Steve Martin, I see a band that is sure of themselves and ready to take the sound of Bluegrass tradition and innovation to new audiences around the world. And as a final nominee for this year's IBMA Entertainer of the Year, it is safe to say the Bluegrass community appreciates this as well. As soon as I heard the Steep Canyon Rangers, I knew I wanted to be a part of what they were doing. I have been lucky to get to know Mike Guggino — their killer mandolin player — and am immensely proud that I have been able to build and maintain his mandolin and mandola. I am always impressed by how much energy they bring to their sets, how hard they work and how nice these guys are. In my opinion, they are a benchmark for combining tradition and innovation in Bluegrass. 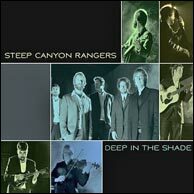 Steep Canyon Rangers - Deep In The Shade, from 2011. Click to purchase. Mandolin Cafe: Congratulations to you and the Steep Canyon Rangers for receiving five IBMA nominations and being named Entertainers of the Year! Mike Guggino: Thank you very much! We were so honored and excited to be nominated by the IBMA for these awards. To be included along with some of our musical heroes is simply amazing. It has been such a great experience for the Steep Canyon Rangers these last few years touring with Steve Martin. We have played bluegrass music for some of the largest audiences on some of the biggest stages in the U.S. and the world. We (including Steve) have taken this on with a great deal of care and respect for how bluegrass music is portrayed to new audiences. We strive to put on a show that is both entertaining and dignified. For many people who come to the show, we are the first bluegrass band they have ever heard or seen perform live. Having them leave and tell you that they now love bluegrass and can't wait to learn more about it is so gratifying. I think what Steve Martin is doing for the promotion of bluegrass music may be the most significant thing for the genre since O Brother, Where Art Thou? I never thought I would see a discussion of Scruggs-style and claw-hammer style banjo on a late night television show like The Colbert Report! L-R: Charles Humphrey III (bass/vocals), Woody Platt (guitar/lead vocals), Mike Guggino (mandolin/vocals), Graham Sharp (banjo/vocals), Nicky Sanders (fiddle/vocals). Mandolin Cafe: Your approach to mandolin is clearly in the traditional camp. What musicians had an influence early in your development? Mike Guggino: I grew up playing music but not bluegrass. I played mostly classical and jazz early on and later fell into the rock guitar mold as many teenagers do. It wasn't until college that I first heard and paid attention to bluegrass and mandolin music. Some of my new friends played bluegrass instruments and turned me on to various bluegrass artists and their recordings: Hot Rize, Seldom Scene, Tony Rice, Old & In The Way, Newgrass Revival, and John Hartford. I was immediately hooked! The mandolin, specifically that of David Grisman and Sam Bush, was what I was drawn to the most and I bought an inexpensive A-style at my local music store in Brevard, NC. I messed around with "Dawg" music a lot at first because it appealed to my jazz and classical background. I could play a lot of the melodies but I still felt like I was missing something. Then I remember reading an article somewhere that basically said if you wanted to really understand Grisman's style and to try to sound more like him you had to understand Monroe's mandolin playing as well. That was quite a revelation. I started doing my homework. It wasn't long before I realized that ALL of the mandolin players I had been listening to had been influenced directly or indirectly by the music of Bill Monroe. The more I listened to and studied Monroe's playing, the more I appreciated it and wanted to imitate it. I really haven't looked back. Naturally I was and still am very inspired by more contemporary "downstroke," Monroe influenced players, such as Ronnie McCoury and Mike Compton. I am always amazed at the virtuosic level these guys have taken the traditional bluegrass mandolin approach. Interestingly, it was one of Compton's mandolin students, Daniel Coolik, who first showed me the technique of using fast downstrokes. He was a friend of mine at the University of North Carolina Asheville and we were jamming one day. I'll never forget he played the greatest downstroke break on some tune like Foggy Mountain Special and I was blown away! I felt that I had found the style I wanted to pursue for my own mandolin playing. Steep Canyon Rangers performing Mike Guggino's original composition Knob Creek. Video by John Watson at the Mountain Song Music Festival in Brevard, North Carolina, September 9, 2011. Mandolin Cafe: The Steep Canyon Rangers are known for their classic sounding original compositions. Was this path a conscious decision from the start? Mike Guggino: Writing and performing original material has always been a focus for the band, even in its formative years. I can remember the first time Woody took me to meet Graham and Charles for our first informal "pick." We played a few bluegrass standards at first and then the guys wanted to play a tune written by Woody. I remember thinking, "why?" Why wouldn't we play a classic Jimmy Martin or Flatt and Scruggs tune? Isn't that the bluegrass way? Then it occurred to me (as it had already to the other guys) that all the great first and second generation bluegrass bands had set themselves apart by having original material and their own styles. I think this is one of the best decisions we ever made early on as a band: playing mostly original material. It immediately set us on a path where we could develop our own distinct band sound. Mandolin Cafe: What's the process for coming up with an original composition? Mike Guggino: Graham (banjo) and Charles (bass) are our primary lyric songwriters. Nicky (fiddle) and I have written several instrumentals for the band over the years. Usually one of the songwriters will bring the rough lyrics and chords to Woody (lead singer/guitar) to work on the basic melody, chord structure, and key signature. Then the band gets together to arrange the song as a group. This has always been a very democratic process for us. If someone doesn't like the way a song sounds, we generally won't play it. Steve Martin and the Steep Canyon Rangers, Rare Bird Alert, 2011. Click to purchase. When our touring schedule slows down in the winter months, we try to practice at least once a week when we are home. The guys are constantly writing songs on the road too. In fact, we've used a lot of the downtime during the Steve Martin Tour to work on new material for a project we will begin recording this month. As a musician who does not write lyrics, I feel very fortunate to play in a band with such prolific songwriters. Our band is unique too in that Woody and I sing most of the material that the other guys have written. They are really good about keeping our vocal styles and ranges in mind when putting together new material. Mandolin Cafe: What is it like to tour with Steve Martin and how did the he become a part of the group? This probably wasn't the path the band ever imagined when you formed! Mike Guggino: When we were in college, I don't think any of us ever thought we would be supporting ourselves and families as full-time, touring bluegrass musicians upon graduating. We certainly could never have anticipated we would one day be collaborating musically and comedically with Steve Martin! But life is serendipitous sometimes. 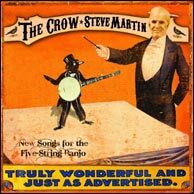 Steve Martin - The Crow: New Songs For the Five-String Banjo, from 2010. Click to purchase. Woody's older brother had a friend he had met in North Carolina who lived in New York City. Through Woody, she befriended our band and would often come see us play at our shows in the city. I believe she even put us all up on her couches and floor a few times! While writing for The New Yorker, she somehow had met Steve and they began dating. Before we knew it, they were getting married. She and her family like to vacation in NC and on one such trip, she invited us over for a dinner party to meet Steve. We of course brought our instruments and picked for several hours after dinner. We kind of hit it off immediately, personally and musically. The Rangers had a show in NYC not long after that and we invited him to join us for a song on our show. He kindly obliged! Knowing that he preferred to play mostly tunes he had written on the banjo, we worked very hard on learning our best possible version of his tune The Crow. I can remember rehearsing it backstage with him before the show. After we had played it all the way through the first time he said something to the effect of it never sounding better. We were so excited and relieved! It wasn't long before we got the call to be his touring band to support the release of The Crow: New Songs For The Five-String Banjo in 2009. We've now played dozens of shows together, collaborated on a recording (Rare Bird Alert from 2010), worked on a movie soundtrack, been on national television numerous times, recorded a song with Paul McCartney and the Dixie Chicks, and met and played for the President of the United States at the White House. Somebody pinch me! Mandolin Cafe: Your tenor singing is an integral part of the Steep Canyon Rangers sound. How did your style evolve and what advice do you have for aspiring harmony singers? Any tips for balancing rhythm & lead playing with singing? Mike Guggino: I never really had any goals of being a singer when the band started. The original fiddle player, Lizzie Hamilton, sang all the high parts. I sang a few baritone parts but it never really seemed necessary for any of us guys to sing the high parts when we had a girl in the band. When she decided to go back to graduate school and leave the band in 2002, we not only lost our fiddle player but also our tenor singer. It seems almost standard for the mandolin player to sing the tenor parts in most bluegrass bands so I decided I'd give it a try. Woody has a lower lead range than many bluegrass singers and I realized I could sing higher than he, so it worked out fine. We were all more or less learning how to sing better in general at that time. We worked hard at getting the basics down and absorbed lots of advice from other great singers in bluegrass, such as Russell Johnson of the Grass Cats. Russell lived in the Raleigh/Chapel Hill area when the band was first getting started and we would often go see him play. He was nice enough to offer us advice about both the musical and business side of things. For singing, he stressed to us the importance of getting the lead part the way we wanted it and then working the parts above and below around that melody. He taught us about blending parts by using precise phrasing and uniform vowel sounds. Sometimes you can sing parts together that are in tune but if the singers are not pronouncing vowel sounds the same way, they can sound out of tune. These sort of fundamentals have been helpful over the years for the band and myself in developing our vocals. Because I have never really sang with anyone else besides Woody, I think he and I have developed a really nice blend together. When you sing with someone for a long time you start to learn their tendencies. I think the most important advice I would give to anyone who is learning to sing tenor is to listen to your lead singer and try to match every nuance of the sound of his or her voice as best as you can. Try to make it sound like one voice! Video from the 3rd Annual DelFest Bluegrass Festival, Allegany County Fairgrounds, Cumberland, Maryland, May 29, 2010. Mandolin Cafe: What's your practice routine and what are some of the things that led to breakthroughs in your playing? 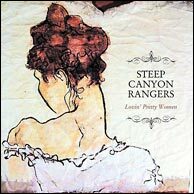 Steep Canyon Rangers - Lovin' Pretty Women, from 2007. Click to purchase. Mike Guggino: My practice routine has varied somewhat over the years. When I first started playing, I worked hard at learning a lot of new tunes. I wanted to absorb the music as quickly as possible and have many of the signature bluegrass songs and "licks" under my belt. I listened to a lot of Bill Monroe recordings and tried to play his "kick-offs" and solos. I learned fiddle tunes from other players and from many of the tune books now available. Because I was coming from a very learned musical background, I also practiced scale, arpeggio, and chord techniques. I still do all of those things today but I spend more time working on our band's songs and the tunes that I write than learning the old standards. Sometimes I wish I could devote more time to this because it is so inspiring and fun! I also think it is a vital part of developing a mature style and musical vocabulary for any kind of music. When I was studying jazz guitar in college, my teacher focused a lot on transcribing well known player's solos. You can gain so much insight into how a great player relates melodies and chords by doing this over and over. Even if you don't get it exactly the same (and that's hard do!) you gain such volumes of information. I immediately transferred this idea over to learning bluegrass solos from mandolin players I liked. Mandolin Cafe: Everyone in the band attended the University of North Carolina. Is that correct? Mike Guggino: Nicky attended Berklee College of Music and joined the band several years after we first got started. Woody, Charles, and Graham attended UNC and started the band there. I grew up with Woody and he brought me into the mix because they needed a mandolin player. When the band started booking its first gigs, I was driving to Chapel Hill on weekends to play the shows while attending UNC Asheville. We all moved into a house together in Asheville after we graduated college. This is when we really started working hard to play music full-time as our jobs. We knew we needed to get better at picking and singing to get better gigs, too. We had a record player and huge collection of old bluegrass vinyls set up in the corner of the living room. Everyone would sort of take turns throughout the day sitting there learning Flatt and Scruggs, Stanley Brothers, or Bill Monroe tunes. We would also have band rehearsals several times a week. It was our homeschool of bluegrass! I think our whole band made huge strides forward during this time in terms of our personal playing abilities and our basic understanding of bluegrass in general. 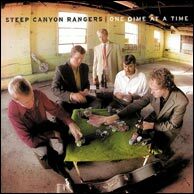 Steep Canyon Rangers - One Dime At A Time, from 2005. Click to purchase. Mandolin Cafe: You have recorded a fair amount with a mandola. How do you decide which songs are a good fit and what do you try to bring out with the mandola to make it different from a mandolin? Mike Guggino: Will Kimble was nice enough to build a wonderful A-style mandola for me several years ago when I bought my mandolin from him. I had never really thought much about playing the mandola until he asked if I was interested in having one made. I sort of just said yes not knowing how I was going to use it with the band. I had seen some other bluegrass players like Wayne Benson and Ronnie McCoury use it in their shows so I knew it could work well. For me, the mandola is great on slower or medium paced songs that don't need a lot of chop rhythm. In fact, I usually play rhythm more like a guitar than a mandolin in most cases using open strings. It's nice because it can give a song more emphasis on the downbeat and bring out the rhythm feel that the guitar is playing. This can be really effective for diversifying a long bluegrass set filled with mandolin chop rhythm on every song. Comment from Will Kimble: "This is a photo of Mike's mandolin in varnish, but not yet French polished, taken April 23, 2006. It's very unusual for me to take pictures of the mandolins in varnish but not French polished. Interestingly, Mike's mandolin was #98 and Andy Statman's #99." Melodically, the mandola is great for tunes that are in keys where I can utilize the low, open strings in 1st position. This is, after all, what makes the two instruments sound different. Being able to include that low, open C note or the D note of the second fret in the melody is sort of my criteria for whether or not it's a candidate for a particular song. Keys like C, F, and Dm are especially good for bringing out the low end character of the instrument. 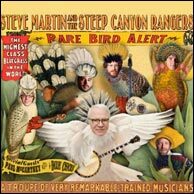 I recently recorded two songs on with the mandola on the Steve Martin and the Steep Canyon Rangers CD Rare Bird Alert. One tune, Yellow Backed Fly, is kind of a bouncy, mellow, old-time tune. Steve is playing claw-hammer banjo and I thought the mandolin chop seemed a bit out of character and not what the song needed. Also, it is in F major and I realized if I played mandola I could double his lead melody an octave lower and really make it sound rich and full. I thought it came off very nicely. The other tune, The Great Remember is a very slow and meditative type instrumental. Steve again is playing claw-hammer banjo in a drop C tuning with the same low C note as the mandola's open 4th string. This made it possible to play the melody notes in the same register and allowed me to sort of fill in rhythmically with soft, open string strumming and crosspicking and no chop. The darker sound of the mandola and banjo in that low C tuning is quite melancholy and perfect for that song. Steve has also managed to work in a joke on our live shows about me playing mandola. It's much better to hear him tell it so you will just have to come see the show! From their appearance in the nation's capitol on July 4, 2011. Mandolin Cafe: Tell us about your interest in Italian mandolin music. Any plans to record? 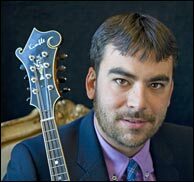 Mike Guggino: I certainly discovered the mandolin through the bluegrass world. That was the music I wanted to learn and I had never really heard the mandolin much in any other settings. My grandfather was the one who first exposed me to Italian mandolin music and quite by accident. He was born in U.S. the year my great-grandparents emigrated from Sicily. He grew up in a predominantly Italian neighborhood in Tampa, FL and started learning the violin as a teenager. Although he studied classical violin in college, he went on to serve in the Air Force and that, not music became his career. We would sometimes play music together when I was growing up and I will never forget those precious memories. Unfortunately, by the time I was learning the mandolin in college he was starting to lose his memory to Alzheimer's. He could still remember how to play many songs but usually not their names: mostly classical or jazz pieces. I'll never forget the last time we ever played together he played this one haunting melody for me. It wasn't classical and it wasn't like anything I was really familiar with. He could not remember the name of it but he said it was a melody he remembered hearing played by street musicians in his neighborhood. Folks would often go around serenading in the neighborhood where he grew up playing guitars, violins, accordions, and of course, mandolins. Who knows how many more tunes he might have been able to share with me if he had not lost his memory. It sort of hit me right then and there that I was a mandolin player with Italian roots playing the most uniquely Italian instrument there ever was and I knew nothing about the history of this instrument or the music that was originally played on it. I immediately began doing as much research as I could to find out about Italian folk music and it's roots. 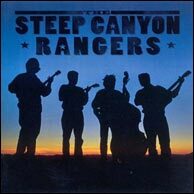 Steep Canyon Rangers - their self-titled release from 2004. Click to purchase. It can be very rewarding to learn about one's cultural heritage while learning some really amazing music along the way! It turns out that the tune my grandfather played was probably a waltz or mazurka from Sicily but I still do not know its name. Scores of Italian immigrants brought this music with them to the States and continued to compose music in this style for many decades. Both in Italy and the U.S., there is a real danger for this music to become a lost art if we are not careful. Fortunately, there are some folks out there doing some terrific research, preservation, and performing of Italian folk music. Artists such as Beppe Gambetta, Carlo Aonzo, the late Butch Baldassari, John T. La Barbera, Mike Marshall and Caterina Lichtenburg have recorded and published some of this music in recent years and these are fantastic resources. There is also a great book by Sheri M. Crawford called Mandolin Melodies that emphasizes a lot of tunes written by Italian-American composers that lived in the San Francisco area, such as Rudy Cipolla and Matteo Casserino. It's been a labor of love for me over the last 10 years researching Italian mandolin music. It's been slow going but steady. My goal has really been just to have fun learning tunes and hopefully to carry this tradition on in the process. I started a trio with a guitar player (Barrett Smith) and Nicky (from the Steep Canyon Rangers) on violin in my hometown. When I am not touring, we play a few gigs locally. We have not recorded anything yet but I hope to in the near future. Photo from the 5th Annual Mountain Song Festival in Brevard, North Carolina, September 10, 2010. The Steep Canyon Rangers were nominated together with Steve Martin for the 2011 International Bluegrass Music Association's Entertainer of the the Year (winners! ), Album of the Year (Rare Bird Alert), Instrumental Recorded Performance of the Year (Rare Bird Alert), Best Liner Notes for a Record Project (Rare Bird Alert) and Best Graphic Design for a Recorded Project (Rare Bird Alert). The IBMA awards were held this past Thursday, September 29 at Nashville's historic Ryman Auditorium. Main instruments: Kimble F-5 mandolin and Kimble H mandola. Strings: On mandolin I use D'Addario J-74s but swap the .015 A string for a .016). On mandola I use D'Addario J-76s. Cases: Calton Cases and Colorado Case Covers. Picks: Blue Chip TAD 60. Microphones: Live I use a Nuemann KM 184 and usually a pair of KM 84s in the studio. SCR quickly became crowd favorites at our local festival here in Wyoming. Folks love 'em, and Mike is one of my favorite mandolin players. Great licks and a nice guy too. Great Interview. The Discography has omitted the album that introduced me to these guys: "Mr. Taylor's New Home" (2002). This album has the Knob Creek tune on it (video above). SCR are making some really important music right now. Thanks for sharing the interview--very positive story and well deserved success! A little late but noting the anniversary of the interview with this fine musician from this date 2011.